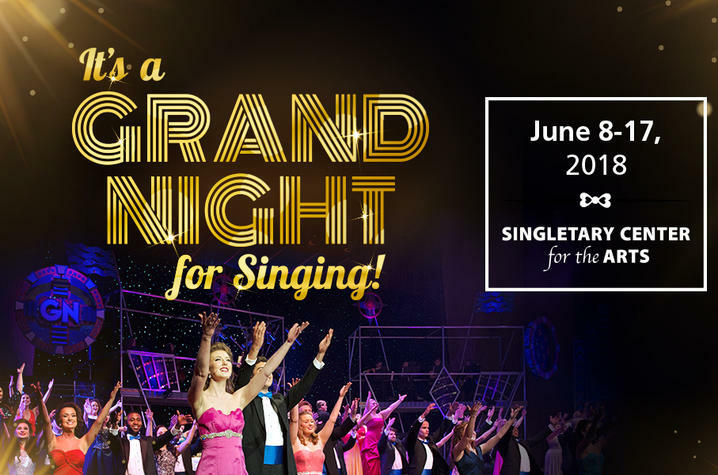 Watch KET's program on the 25th anniversary performances of "It's a Grand Night for Singing!" in 2017 above. LEXINGTON, Ky. (June 5, 2018) — You’re invited to kick off your summer with one of Central Kentucky’s most beloved arts traditions — “It’s a Grand Night for Singing!” Join University of Kentucky Opera Theatre for a program showcasing the best vocalists in the region performing many of Billboard and Broadway’s most beloved hits June 8-17, at the Singletary Center for the Arts. Executive Producer and Music Director Everett McCorvey and Director Peggy Stamps bring together a company of more than 100 vocalists, instrumentalists and crew again this summer. Students from UK Opera Theatre join forces with some of the most talented teen and adult performers in the Lexington community in this popular annual town-and-gown revue. Rob Baldwin and Rob Seebacher will return as conductor and assistant conductor of the orchestra. This summer’s audiences will recognize popular tunes from such Broadway classics as “West Side Story,” “The Sound of Music” and “Hello, Dolly!” as well as new hits from 2017 Tony Award-winner “Dear Evan Hansen” and the 2017 film “The Greatest Showman.” Much of the music will speak to themes of inclusion, community and humanity. “It’s a ‘feel good’ evening,” McCorvey said. “You’ll see talent that you would expect on Broadway — it’s that good! This year choreographer Grady McLeod Bowman will help the cast bring the songs to life on stage. Bowman is a New York City-based choreographer and creative artist who Dance Magazine has called "exceptionally versatile" and "on the rise.” He has worked alongside Tony Award-winners Julie Andrews, Chris Gattelli, Joe Mantello and Randy Johnson as an associate director and associate choreographer on productions including “Dogfight” (Second Stage Theatre), “In Your Arms” (The Old Globe), “A Night with Janis Joplin” (Capital Repertory Theatre), “The Great American Mousical” (Goodspeed Opera House) and “Top Hat” (NY Developmental Lab). Bowman’s choreography credits include “The Very Hungry Caterpillar Show” (Off-Broadway), “Joseph and the Amazing Technicolor Dreamcoat” (Drury Lane Theatre), “My Fair Lady” (Olney Theatre), “A Night with Janis Joplin” (Capital Rep/Barter Theatre/Laguna Playhouse), “Grease” (Gateway Playhouse), “Beauty and the Beast” (Northern Stage), “Godspell” (Pace University) and “Jesus Christ Superstar” (Cape Fear Regional Theatre). Showtimes for the six performances of "Grand Night" are 7:30 p.m., June 8, 9, 15 and 16, and 2 p.m., June 10 and 17. "Grand Night" tickets are $45 for general admission; $40 for seniors and UK faculty; and $13 for students with a valid student ID. In addition, each performance will also have a limited number of select seats available to UK staff for only $25. The special staff price is presented in memory of Russ Williams, the university's first representative of the staff on UK's Board of Trustees who died in 2009. Staff tickets must be purchased in person with a valid staff ID. Tickets for "Grand Night" are available through the Singletary Center ticket office, by phone at 859-257-4929, online at www.scfatickets.com or in person at the venue. All applicable fees will be added to tickets upon purchase transaction. UK Opera Theatre is part of the UK School of Music at the UK College of Fine Arts. The school has garnered a national reputation for high-caliber education in opera, choral and instrumental music performance, as well as music education, music therapy, composition, and theory and music history.